Until now I haven't been a fan of Wes Anderson's work, this despite the fact that he is a purveyor of my favourite genre, black comedy. For me his films always show the strain of his relentless efforts to be quirky. 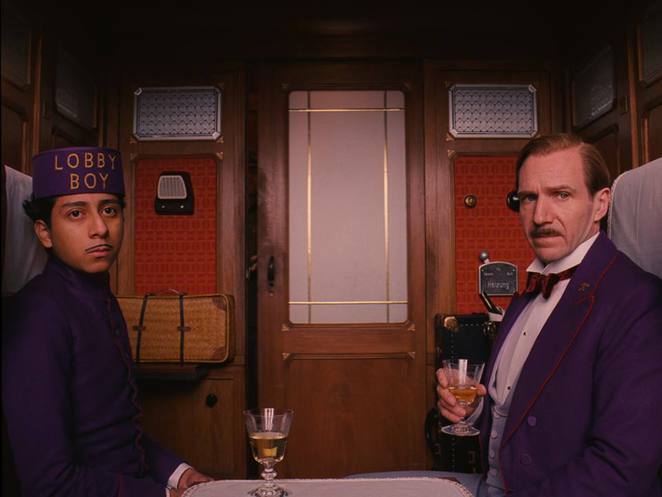 No such accusation can be pointed at The Grand Budapest Hotel, which is so effortlessly whacko it's intoxicating. Firstly, let's be clear, The Grand Budapest Hotel is not in Hungary. It is in the fictitious Republic of Rubowka. For this is a film of fabrication, loosely resembling real places, people and events. A certain level of poetic licence is evident at the start, as the story within a story within a story is being told by a rather eccentric gentleman Mr Moustafa (F. Murray Abraham) to one of the hotel's guests (Jude Law). We step back to a period between the two world wars. Zubrowka, in a sign of the times, has become a kind of paranoid, authoritarian police state. The Grand Budapest Hotel stands as a decadent oasis of grandeur for the rich and privileged, blissfully ignorant of the danger and chaos closing in around it. Presiding over the hotel is concierge Gustave H (Ralph Fiennes) who, true to the greats of his profession, manages to be both imperious and servile. Over the years Monsieur Gustave has accumulated a devoted coterie of clients, particularly wealthy, elderly ladies. One of these, Madame D (a heavily wrinkled Tilda Swinton) kicks the bucket, bequeathing a highly valuable painting, Boy With Apple, to the concierge. Unfortunately this doesn't go down well with the corrupt and violent family of the deceased, who will stop at nothing to prevent Gustave from collecting his priceless painting. Boy With Apple was painted especially for the film. Within the story it is purported to be an important work from the Renaissance era. It looks authentic enough yet slightly gaudy with a subtle undercurrent of menace. In this regard it is in perfect keeping with the film. The Grand Budapest Hotel is like a series of tableaux that look both faithful to the period, yet deliberately fake, like the colour has been turned up too high. It's a bright and delirious bauble which, despite the breakneck speed of the shenanigans and ridiculous dialogue, keeps gently reminding you of the damage war does to a nation's psyche. Like Gustave H and his duchesses, Anderson has a dedicated stock of gifted actors who keep coming back for more. 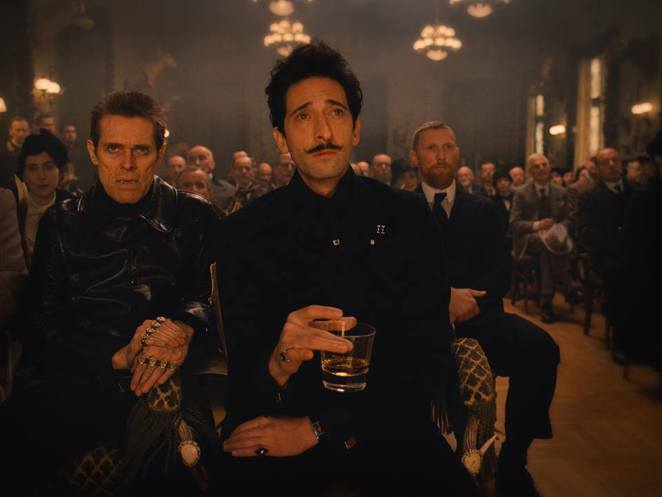 The dizzying line-up here, in addition to Swinton includes Bill Murray, Owen Wilson, Jason Schwartzman, Ed Norton, Adrien Brody and Willem Dafoe. Then there are Anderson newbies that include Jeff Goldblum, Harvey Keitel, Saoirse Ronan, Tom Wilkinson and European stars Mathieu Amalric and Lea Seydoux. Towering over proceedings though is Ralph Fiennes. His Gustave H is a creation of comic genius. For all his vanity, oiliness and dubious moral standing, Fiennes invests Gustave with such a joie de vivre it's impossible not to get swept up in his charm and exuberance. We've seen only glimpses of Fiennes' comedic talents over the years, In Bruge being one of his few forays into the genre. One can only hope he chooses to direct his formidable talents in this direction more often. 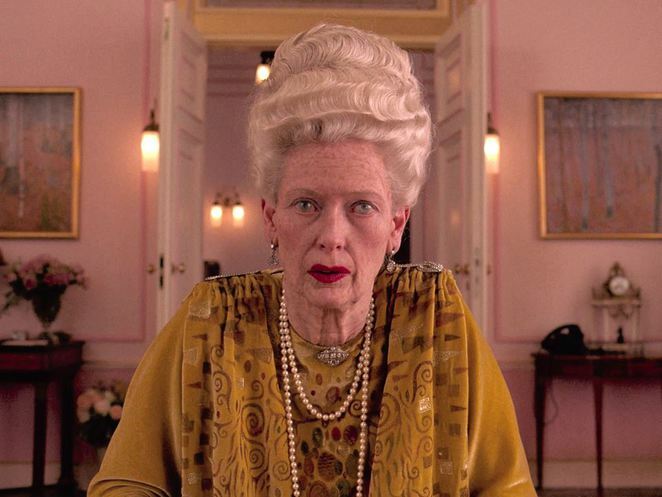 If you're already a fan of Wes Anderson, chances are you'll love The Grand Budapest Hotel. If, like me, you weren't a fan before, this could very well convert you.